Volunteering, whether at home or abroad is an excellent way to make a meaningful contribution to causes close to your heart. A number of travelers are realizing that the fruits of volunteering abroad during their gap years, sabbaticals or travels go beyond a sense of fulfillment. Volunteering adds real skills to your resumé and employers today are taking notice of these. I often get asked how I narrow down on a particular volunteer program and what are the right questions to ask before signing up to volunteer. 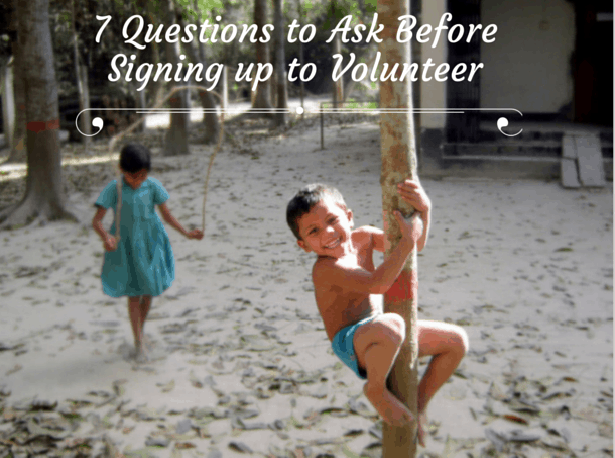 When organizing your volunteer program, especially if it’s abroad, it’s important to get answers to these 7 questions to ensure that the program you’re signing up for is right for you. It may seem strange to ask yourself or the organization this question, but it’s important to have a clear answer to this. “Because I want to” or “Because I have good intentions” are not good answers. What you need is a clear objective reasoning as to why you’re a good fit for this particular volunteer role. Some organizations will accept just about anyone, because of shortage of hands to complete tasks. This does not mean that every volunteer will be a valuable resource. An inexperienced person or someone who cannot speak the local language may actually become a burden for the organization. Or you may be volunteering to do something for free that a local would be paid for. While you may have good intentions, you’re actually defeating the purpose right there. Some organizations offer a specific role while others may give you a wide choice of roles where you need to pick one. In either case, you need to match your expertise and skills with the role being offered. Don’t just sign up to volunteer for something that you clearly don’t have the skills for. Many grassroots level organizations don’t have any screening process in place so they will happily accept you to teach English even if you don’t speak it very well. This is detrimental to the people that you intend to help, as it leads to knowledge gaps and can become confusing. If a role requires a certain level of physical fitness, make sure that you will have that by the time you’re actually volunteering, otherwise it will end up becoming a tiresome chore. If you’re given the flexibility to choose how you want to volunteer your time and skills, then decide wisely so that you can make a meaningful contribution. Earlier this year I volunteered in Vietnam, and decided to teach a basic financial and economic awareness course to young adults from the local Black Hmong community. I have an academic background and substantial professional experience in these subjects and adapted them to local requirements to make the course relevant for my students. 3. Is the organization recognized? It’s very important to know if the organization that you’re signing up with is recognized as an NGO or charity or if it has a legal identity. There are a number of fraudulent organizations posing as NGOs in Asia that make travelers work for free, offering them poor conditions of housing and meals in exchange and charging hefty volunteer fees. In such cases, you’d not only be stealing the jobs of hard working locals, but also contributing to an environment of greed. How does the idea of being questioned or jailed by authorities in a foreign country sound when all you wanted was to help people? You’re right, it sounds terrible. You don’t want to be mixed up in a mess like that in a country where you don’t speak the local tongue and don’t understand the bureaucratic complexities. Yet, there are plenty of organizations that ask you never to mention to anyone that you’re volunteering with them and especially not to immigration. I’ve seen and experienced that lying to or hiding things from authorities can lead to a confusing, scary situation and an environment of mistrust and I don’t recommend it at all. It’s important to ensure that whatever you sign up to do is legal. 5. Is this the best way? At the risk of being slightly repetitive and only because this point is not simply one dimensional, I’m going to say it again. Ask yourself and do your research to find out if what you’re going to do in your volunteer program actually solves a problem. If yes, then is that the best way to solve it? Make sure you’re actually adding value to the situation rather than taking away from it. Don’t do something to achieve a sense of self fulfillment. Volunteering is not about how it makes you feel, but more about the value you bring to the task at hand. Do your research and find out who else has volunteered with them in the past. Get in touch with past volunteers and try to get as much information as possible about the place, people, culture, organization and the volunteer program. A past volunteer gave me an important housing tip about Sapa in Vietnam that I had no idea about and saved me from a sticky last minute situation. 7. Is there a support system? A good volunteer program should have a solid support system in place. This is usually a network of coordinators and fellow volunteers. Coordinators should be available and willing to talk to you about any concerns regarding the arrangement even before you travel to their country to volunteer with them. You shouldn’t be made to feel neglected or unimportant and the organization owes it to you to help with any issues or questions you may have regarding the program. My first volunteer internship experience with the Grameen Bank in Dhaka, Bangladesh was particularly enjoyable because of attentive and concerned coordinators and a wonderful group of fellow volunteers who helped each other and looked out for one another all the time. It’s important to volunteer for the right reasons and not just to achieve a sense of ‘doing good’. It can be easy to lose sight of the very essence of volunteering, which is to contribute your time and skills without any benefit in return. Consider it an added bonus if you’re being offered meals or housing in exchange, but don’t expect too much or focus on those things. Ask yourself if volunteering abroad in general is right for you and if you have the patience to work in a program that may not necessarily be very organized. If the answers to these questions are positive, you’re ready to take your first steps into the world of volunteering. Hi Natasha, we certainly agree with your points. We were volunteering in Ecuador and thought sometime to take work away from locals. I think this is a really good starting point. I think volunteers should remember that the communities that you join were there before you came and will be there after you leave. Your actions there can have a long lasting impact so try to make sure they are positive. You’re right, asking what sort of support structure is available is very important! It is hard being in a new country, a lot of time around people that don’t speak a language you’re used to and it is NECESSARY to have someone to turn to with questions, problems, and ideas! 🙂 Great list! This is a beautiful post, Natasha. We meet so many travellers who are volunteering more for themselves than for any other reason. If someone has never worked a day outside in their lives before, what makes them think they are qualified to build a hospital? Yes they may have noble ideals, but they fail to see the bigger picture. I for example will never volunteer with an organisation that deals with kids, because I don’t have any experience working with kids. If more people went through the thought processes you mentioned here they may be able to direct their efforts in a more beneficial way. Cheers for publishing this! Thanks Jazza! Glad you liked the article. I hope it helps others to focus when they decide to volunteer and are looking for projects.